Rehau windows and doors have been installed in a luxury houseboat in Belfast, providing a clean and bright finish to the Scandinavian-inspired boat, while keeping it cosy and warm inside. Now listed on Air B&B as one of the top featured properties in Northern Ireland, the boat – affectionately known as Nolly – was once destined for the scrapyard. 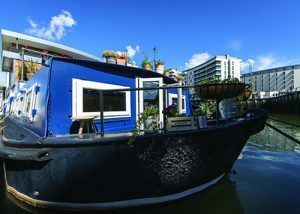 She was rescued by newly retired couple Gillian and David Campbell, who bought the barge as a renovation project with the intention of transforming her into a houseboat to be moored in the marina of Belfast’s Titanic Quarter. Gillian Campbell said: “We travelled a lot over the years with David’s job, and during our time in Denmark, we just fell in love with the houseboats we saw in Copenhagen. They were so cosy! So, when David retired, we decided to take on a project to build our own houseboat. We needed a big and wide barge which would provide the base for a spacious and light living space, so when we found Nolly, we knew she was the one. While some of the boat’s original portholes could be salvaged for reuse on internal doors and walls, the exterior windows all needed replacing with new ones. When consulting with the project team about options, Gillian was very particular about the aesthetics of the new windows and also their ability to retain heat and reduce condensation. 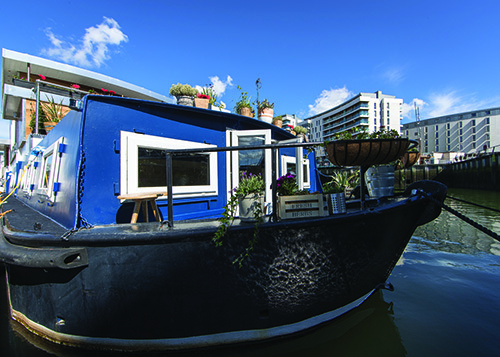 Gillian continued: “It was really important to us that the boat was warm and cosy, so the choice of windows was an integral part of retaining the boat’s heat and also reducing condensation, which can be problematic on houseboats. We were advised against using timber frames that can rot, so PVC-U was the best alternative. Initially, I was a bit unsure about how they would look but I am delighted with them – they are just so clean and bright and let in so much light, particularly in the upstairs living area.” Gillian was advised on the window and door specification by Rehau’s trade counter partner in Belfast, Windowmate Thomas McAllister, Sales Manager for Windowmate in Northern Ireland who explored a number of options for the houseboat and ultimately recommended the Rehau Total70 range. The casement and fixed windows could be easily installed in the steel frame of the boat and offered a high U-value for excellent thermal efficiency.